Behr Iron & Steel Inc. recently pled guilty to failing to provide required lockout/tagout and confined space protection for employees assigned to clean a shredder discharge pit at its Beloit, Ill., facility. The metals recycling company admitted that those violations caused the death of a worker whose arm was caught in a moving, unguarded conveyor belt. The worker was pulled into the machine and killed. Behr also admitted that workers were inadequately trained on how to use the shredder and conveyor belt. The company faces a maximum of five years of probation, maximum fine of $500,000 and restitution to the victim in an amount to be determined by the court at sentencing on July 12, 2016. For more information, read the news release. PCC Structurals-Groton was cited for several safety and health violations after an OSHA inspection found workers exposed to eye, face and body injuries, burns, hearing loss, and fire and explosion hazards at its Groton, Conn., facility. The agency also found exposed live electrical parts, combustible waste that was improperly disposed and insufficient equipment to protect workers from corrosive chemicals. The steel-casting foundry was fined $90,000 in proposed penalties for these violations. Just a month earlier, the company was cited for inadequate fall protection equipment and using an unprotected table saw. Proposed penalties for those violations totaled $14,000. Read the news release for more information. A 51-year-old equipment operator employed by Sharpe Holdings died from head injuries after he was ejected from the rear of a van. An OSHA investigation found that the company did not secure passenger seats, provide safety belts or latch the rear doors of the van used on its cattle farm in La Belle, Mo. Investigators also found workers exposed to amputations and other serious injuries while servicing equipment, electrical and confined space hazards, and no respiratory protection. The company was cited for 17 safety violations and proposed fines of $189,000. This was the third time since 2012 that Sharpe Holdings had been cited by OSHA. The company has been placed in the agency's Severe Violator Enforcement Program. For more information, read the news release. OSHA has cited R&B Contractors LLC of Shandon, Ohio, for 15 safety citations, following the investigation of a worker's death at a Cincinnati job site. The life of a 53-year-old roofer who died after falling 40 feet to the ground could have been saved if his employer had provided proper fall protection. "Four of every 10 fatalities in the construction industry in 2014 were the result of a deadly fall," said Ken Montgomery, OSHA's area director in Cincinnati. 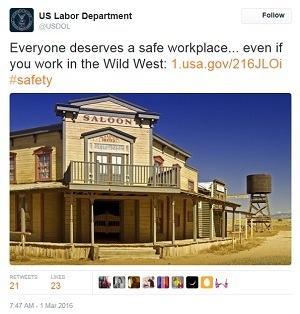 "Yet another worker has died needlessly because his employer failed to protect his safety." The worker was installing a new commercial roof when he fell. OSHA investigators found no guardrails, safety nets or personal fall prevention devices were in place at the time and that R&B failed to train workers about fall hazards. R&B faces proposed penalties of $116,900. For more information, see the news release. Since 2012, 35 workers in three Midwestern states have died after being struck by construction vehicles. Recently a 47-year-old Higginsville, Mo., construction worker was killed after being hit by a waste hauling truck. To address this issue, OSHA has renewed its Regional Emphasis Program, which will focus on reducing worker injury rates involving vehicles, powered industrial trucks, and motorized equipment in construction, general industry and maritime. The emphasis program will include education and prevention activities and inspections in Kansas, Nebraska and Missouri. The program ends Sept. 30, 2016, unless extended. See the news release for additional information. California's Labor Enforcement Task Force has ordered three cabinet-making companies in San Diego County to stop using unguarded saws that put employees at risk for serious injury, including amputation and lacerations. Task force inspectors issued fines of $21,392 for E&A Cabinets, $31,928 for Custom Carpentry Solutions and $105,000 for M. Stanton Company. E&A Cabinets and Custom Carpentry Solutions were ordered to stop all work until they secure workers' compensation insurance. For more information, see the LETF news release. Washington Division of Occupational Safety and Health inspectors found that Alaska Airlines and its ground handler contractor, Menzies Aviation, exposed workers to serious hazards at Sea-Tac International Airport in Seattle. The airline was fined $7,000 and Menzies was fined $62,000 for violations that included failing to provide workers with safety devices or safe workplace practices. Arizona Division of Occupational Safety and Health inspectors issued $21,000 in fines to Taylor's Demolition & Recycling Inc. in Tucson. Inspectors found three serious violations by the company at a city road-widening project where a wall collapse killed one worker and critically injured another. A truck driver fired for refusing to drive a company vehicle pulled from service by the Iowa Department of Transportation is owed $55,000 in back wages, damages and compensation from his employer. An OSHA investigation found that Nebraska-based Jake Rieger Farms LLC violated the whistleblower provisions of the Surface Transportation Assistance Act of 1982. "His employer fired him on the spot and left him to find his way home to Nebraska," said Marcia Drumm, OSHA's regional administrator in Kansas City. OSHA ordered Jake Rieger Farms to pay the driver $25,000 in punitive damages and $30,000 in compensatory damages. For more information, see the news release. The U.S. Department of Labor has come to the defense of several workers who were punished by their employers after reporting potentially deadly workplace hazards. In Alabama, DOL sued Lear Corp for suspending and terminating workers who raised health concerns about exposure to a hazardous chemical used at a Selma facility that manufactures foam. The suit seeks back wages, interest, compensatory and punitive damages for the workers as well as a removal of all references to the matter form the workers’ personnel records. In Pennsylvania, a worker lost three fingers at Lloyd Industries’ plant in Montgomeryville after a machine without safety guards crushed his hand. The company immediately fired the injured worker and later fired another worker suspected of cooperating with OSHA. The suit seeks reinstatement and compensation for lost wages and damages. For more information on the two cases, see the news releases on Lear Corp. and Lloyd Industries. To learn about whistleblower rights see www.whistleblowers.gov. To allow stakeholders more time to review and comment, OSHA has extended the public comment period to May 2, 2016, for its draft Guidance on Data Evaluation for Weight of Evidence Determination. For more information or to comment, visit OSHA's webpage on the draft guidelines. OSHA reminds employers of their obligation to post a copy of OSHA's Form 300A, which summarizes job-related injuries and illnesses logged during 2015. The summary must be displayed in a common area where notices to employees are usually posted each year between Feb. 1 and April 30. OSHA's Pittsburgh Area Office and Mascaro Construction Company L.P. signed an Strategic Partnership agreement to protect workers and provide a safe work environment during construction of Butler VA Health Care Center. The agreement covers workers during construction of a new medical office building which will provide a wide array of medical services for veterans. Through its Strategic Partnership Program, OSHA joins with employers, workers, professional and trade associations, labor organizations and other interested stakeholders to establish specific goals, strategies and performance measures to improve worker safety and health. Texas A&M Engineering Extension Service will hold a free Introduction to Evacuation and Emergency Planning course in Mesquite and San Antonio, Texas, on March 25. The center is an authorized OSHA Training Institute Education Center. The course will help participants develop plans for responding to workplace emergencies and disasters. Registration is available online. The course will take place on the 105th anniversary of the New York City Triangle Shirtwaist Factory fire, which killed 146 workers—including many young women who recently arrived from Europe. 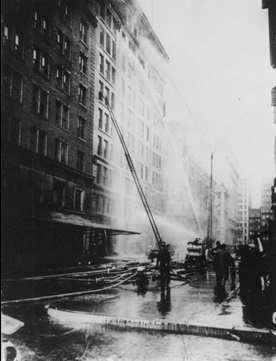 The building had only one fire escape, which collapsed during the rescue effort, and exit doors had been locked by managers to prevent theft.